In February, I attended a session at the LCEEQ conference given by Avi Spector on Gamification. I was skeptical, as gamification is getting a lot of press from corporate training and marketing folks, and we don’t always see eye to eye on classroom practice issues. Avi discusses his definition of gamification and how it compares to game-based learning. Important distinction! *Note: currently, the videos are only available on a computer. We are working to have them available on mobile devices shortly! I was looking for ways to jazz up my curriculum. I work in a learning center with a small group of very disparate students, all working at varying levels of French language ability. I wanted to make my classes more dynamic and to move away from the self-perception about their abilities with which the students were coming. I get a lot of students who come into my class the first day and say to me: “I’m not good at French” – they label themselves as not being good students right off the bat. I wanted for them to have this gaming spirit, the same perseverance that came through when they talked to me about the games they played. I was really inspired by the idea of failing forward, of using mistakes as opportunities to try another strategy, or a new way of doing. I wanted to take the drama out of mistakes and have students say to themselves: “It’s ok, it doesn’t matter, I’m just going to try again”. I also wanted students to feel as though they had all the tools necessary to pass the exam, and for this, I needed them to do a lot of practicing. I didn’t want this work to feel like a burden, I wanted it to be fun. These are the guiding principles that Avi and Catherine followed when designing the gamified learning environment. Avi provides an overview of the setup in Catherine’s FLS classroom. I had students in my class who really didn’t put in very much effort before. Less than the minimum, in fact. After the gamification model was put into place, these same people would submit work and demand feedback so they could win stars. When I would say to them “Well, I’m hesitating between one and two stars” their reaction would be “What do you mean? Give that back, I’m going to change it so I can get two stars!” They never would have said that before! It’s as though they weren’t taking the evaluation so personally anymore, it wasn’t a label that they felt they had to stick on themselves – I’m good, I’m no good. These labels are so immovable and students really feel powerless when they buy into them. I see that students feel more in control of their learning – they feel that they have the power to get one, two or three stars. As Avi would say, they feel a greater sense of agency. I noticed that even when they are trying to convince me to give them more starts, they are actually referring to their work and the clearly stated outcomes: “What do you mean I didn’t use enough comparative language. Here, I wrote ‘more than’, and ‘as much as’ and ‘similarly'”. So the learning is actually very deep and metacognitive. Students are also more clear about expected outcomes, because the outcomes are part of the ‘game’. They are better able to make links between essential knowledge and the situations in which you apply that knowledge. This also gives them more choice as to the ways that they can demonstrate competency growth, within the LES structure that I’m using. My students no longer see tasks and objectives as obstacles to getting a good grade. 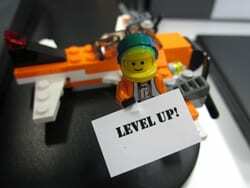 They see them rather as opportunities to ‘level up’. My biggest challenge was a cultural one. I do have students who come from cultures where school and learning are a serious business. It was more difficult to get them into the spirit of the ‘game’, because of the perception that if you’re having fun, you can’t possibly be learning. Also, next year, I won’t be starting the project in January. Starting right away in September will mean that there won’t be a disconnect midway through the year. Are you working on a Gamification project in your classroom or network? I would love to hear about your experience. 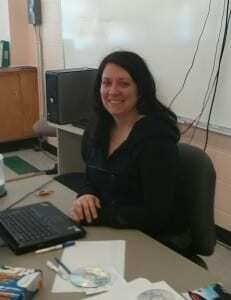 Catherine Boisvert is a French Second Language / Francization teacher at the Eastern Québec Learning Centre in the Central Quebec School Board.